LED Canada™ proudly launches their newest CANPACK™ heavy duty LED lighting line-up. This is the newest offering from LED Canada’s CANPACK series utilizing new Bridglux ™ COB (Chip on Board) LED technology, as well as current “Industry-standard high-powered XTE R2 LED” from CREE™, we easily out-shine the competition. CANPACK™ LED fixtures are built to survive the tough Canadian exterior seasons. Featuring rugged cast housings with UL listed IP66 for easy “North American” standard installation. LCCPWP-40 our 39 W wall pack, easily replaces up to 150 W HID exterior building wall packs and with the color temperature of 4700 K is much more pleasing than the dark amber-orange found with high-pressure sodium bulbs. 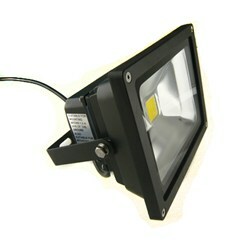 CPFL-20 -- 20 W LED Floodlight: These multipurpose LED floodlights feature Bridgelux ™ USA COB LEDs. CPFL-100 --100 W LED Floodlight: These heavy duty, bracket mounted units easily replace lamps up to 3 times their wattage. CPWM-35 -- 35 Wall Yard Light: These outdoor wall packs feature built-in dusk to dawn sensors, multiple mounting options, including 2 feet of curved steel pole included. CP-HB100--CANPACK LED High bay: feature Bridgelux ™ USA COB, that easily replace 250watt Metal Halide with inexpensive high bay lights from CANPACK ™ 150w, 200w and higher also available now. CANPACK exclusively utilizes neutral white color spectrum cause of its excellent color rendering. This has been proven to show superior object recognition to both Cool white LED and HPS, means safer and more secure exterior areas. We back all of our products with a 3-5 year warranty and offer Service and Parts from our Vancouver and Toronto locations.